This bug report has been submitted to Microsoft. You can track it here (for the crash) and here (for the unraised event). This web page has been specially edited (compared to usual blog entries) so that pinning this page will make the page try reproducing the issue. Updated on 7 April 2017 10:00 AM (CEDT): After further investigation, the content is much richer and the old title (Microsoft Edge crashes when you call certain Live Tile APIs) could not reflect the issue. Updated on 8 April 2017: The event raising issue is by design according to the documentation of mssitepinned event. See the issue tracker link above for details. You have set up your site to enable Live Tile experience. You try using mssitepinned event to detect pinning. Certain invocations of Live Tile APIs fail and crash Microsoft Edge. The mssitepinned event is never raised by Microsoft Edge. The invocation of APIs should succeed and not crash Microsoft Edge. The mssitepinned event should be raised appropriately. One can use browser configuration to specify static polling URIs, which is enough for most scenarios. Open this page in Edge (environment 1 and 2) or IE (environment 3) and continue the reproduction on that page. Pin this page to Start by clicking … > Pin this page to Start (environment 1 and 2) or … > pin to start (environment 3). The tile is pinned to Start but does not have dynamic content. Click here immediately after the pinning has been done successfully. The link tries to call msEnableTileNotificationQueue and msStartPeriodicTileUpdateBatch to specify polling URIs for the tile. 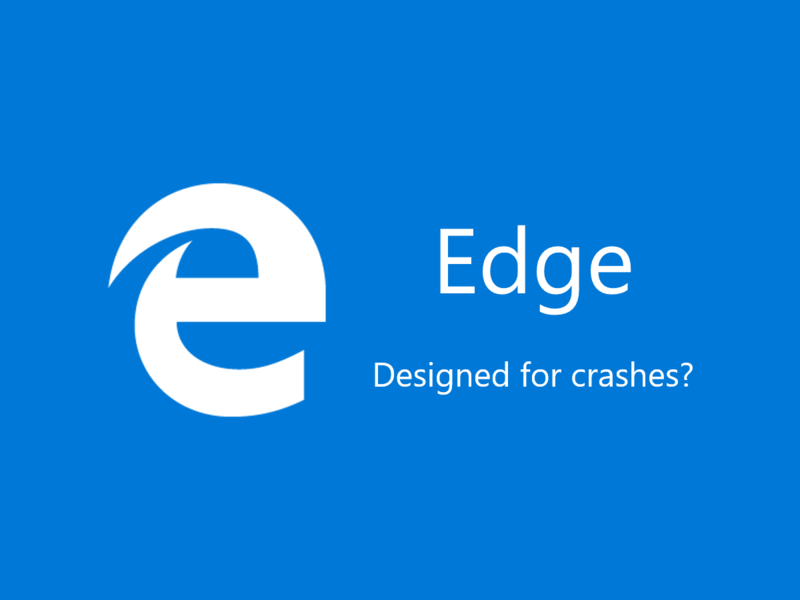 Edge crashes (environment 1 and 2) and IE does not (environment 3). In Start, the tile does not have dynamic content (environment 1 and 2) or has dynamic content (environment 3). This shows that calling msStartPeriodicTileUpdateBatch on a newly pinned page will not give its desired effects and will crash Microsoft Edge. Click here. The link tries to add an event listener to mssitepinned event, which will specify polling URIs for the tile. In Start, the newly pinned tile does not have dynamic content (environment 1 and 2), or has dynamic content (environment 3). Return to Edge (environment 1 and 2) or IE (environment 3) and wait 10 seconds. Nothing happens (environment 1 and 2) or a dialog pops up (environment 3). This shows that mssitepinned event is never raised by Microsoft Edge. Microsoft should investigate and change the implementation of Live Tile APIs so that they work properly. Microsoft should update the documentation found here because it is wrong. It says the first parameter is a string while it should be an array of strings. Also, relevant documentations of window.external object should be edited. Downloadable sample code from MSDN. I tested the page on various platforms. Edge seems to be failing Live Tile APIs brilliantly.